While our staff at Animals Asia's Bear Rescue Center in Chengdu were recording an interview last week, they were lucky enough to catch footage of moon bears Peter and Shamrock in a no holds barred "bear bundle." The two bears pushed, pawed, chewed and threw each other for a good 10 minutes before deciding the match was a draw. Thankfully these two have a lot of history. The pair were rescued together along with four other bears from a bile farm in China. The scene was typical of the horrific industry. Rows of bears were confined in tiny cages so that the liquid from their gall bladder could be painfully extracted and used in traditional medicines. At least 12,000 bears continue to suffer such an awful fate in Vietnam and China. 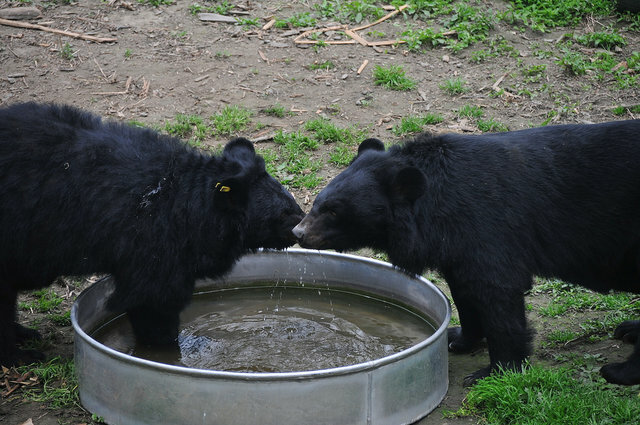 Peter and Shamrock are just two of the 500 bears Animals Asia has rescued and rehabilitated on their sanctuaries. And this kind of play fighting is a regular part of sanctuary life for rescued bears, being a primary source of fun, friendship and exercise. "When the play wrestling begins, you realize how powerful these magnificent creatures are. Of course, it's all fun and games for them and more often than not they spend more time hugging each other than throwing or pushing. More than anything, it's a pleasure to see them able to interact and have fun with each other on their own terms - it's the very least they deserve." "We were just walking round the enclosure conducting a media interview when suddenly the action began. Of course we all stopped what were doing and watched these two old friends playing with big smiles on our faces. Just two years ago Peter and Shamrock arrived in metal cages, terrified and in pain. What a difference these years have seen as they are finally brave and happy enough to play in the open - behaving like bears at last."